If you're in between sizes and have a full hip and/or cup size (D+), we recommend ordering up for a good all-over fit. This 50s Flamingo Sarong Front Swimsuit is a 50s inspired swimsuit with fabulous flamingos! This retro cutie gives you the perfect pin-up look due to her halter top with pleated sweetheart neckline and super flattering skirted typical fifties front. Suits all body shapes and is incredibly slimming thanks to the composition of the fabric and the clever design. 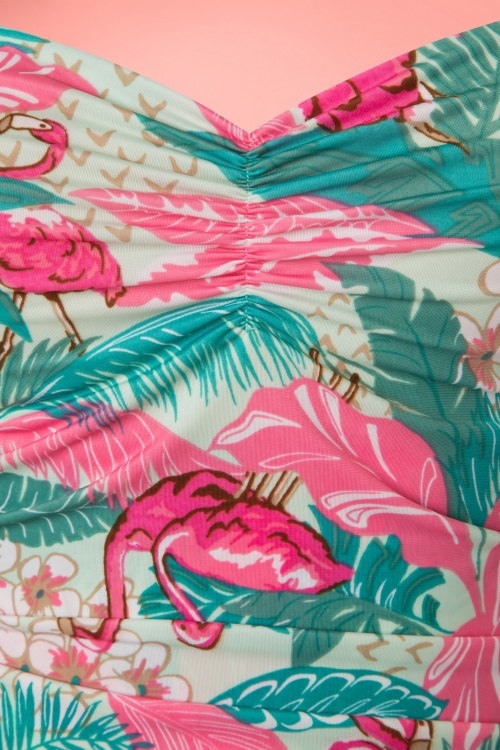 Made from a stretchy, mint green fabric with a cute bright pink floral and flamingo print. 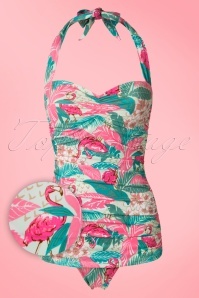 Your vintage swimwear collection just can’t do without! Prachtig badpak, vrolijke mooie stof en vooral fijne pasvorm. Maat klopt weer dankzij het goede advies op de site. Ben er reuze blij! Zeker als flamingo lover a must! Tolle Farben, gut verarbeitet. Macht eine klasse Figur und bringt auch einen etwas größeren Busen gut in Form. Ich denke aber, man sollte das Material nicht zu sehr strapazieren, es fühlt sich nicht so widerstandsfähig an wie z.B. Sportbadeanzüge - raue Oberflächen besser meiden. Trocknet natürlich durch die doppelte Front langsam, aber mich stört das nicht sonderlich.